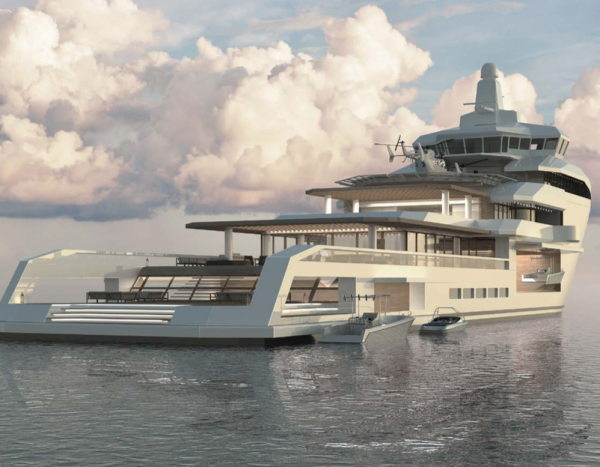 SuperyachtNews.com - Fleet - Do you think you're Vard enough? Do you think you’re Vard enough? 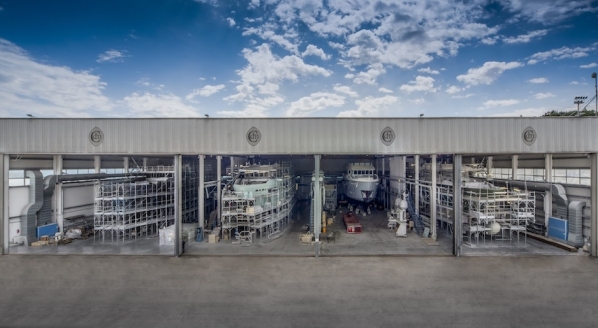 “Trucks of the sea” is how Fincantieri-owned Vard, a commercial yacht builder, refers to its Platform Supply Vessels (PSVs) – and looking at their bodywork, it would seem a fair appraisal. PSVs are intended for a variety of tasks to support offshore operations, such as transporting cargo to and from offshore oil rigs and platforms. But more recently, a decline in offshore oil-rig operations due to the current price of oil has seen these vessels, many of which are new, with conceptually re-purposed designs for use as privately owned luxury explorer yachts. The rugged looking vessels are certainly for the open-minded, adventurous owner, but most importantly, they tick two crucial boxes that your more conventional 80 – 90m explorer yacht builder may not be able to match: they are cost-effective to build and you benefit from the all-important shortened delivery time-frame. Fraser Yachts has just brought an 86.6m Vard vessel, Project Brage (gallery images one to three), onto the market. The proposition of this Pastrovich-designed vessel is much like that of Edmiston’s Vard project – 08 Kilkea (gallery images four to six), a Bannenberg & Rowell design – that came onto the market in March 2016. Brage is on the market with three preliminary pricing options, submitted by different shipyards, all of which have stated that completion time is 18 months subject to capacity and final specifications. 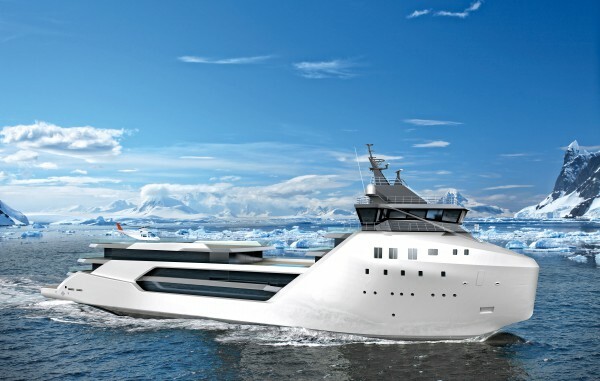 The options are: €80 million for completion at Kleven, Norway, a yard that has come to prominence in this domain after delivering 107m Ulysses and recently launching the 116.2m Kleven 370; the second option is €77 million at Vard, Norway, the vessel’s original builder, suggesting suitable aptitude to complete the project; and the third is €66 million at Viktor Lenac, Croatia, an ‘off the beaten track’ cost-saving option. The entire forward section of Brage is primarily given to housing the 53 crewmembers. The mid-ship area is predominately for storage, of tenders in a double height hangar in the middle decks and a helicopter on the top deck. The entire aft two thirds of the boat – comprising guest accommodation for 30 in 15 staterooms, a main salon, dining room, spa & gym, cinema room, beach club and small toy garage – is primarily for the owners and guests. Staggeringly, the inverted-looking forward section of the boat, with its six distinct decks, would see her boast a volume of considerably more than her current pre-refit tonnage of 4,059gt. If she were delivered today, based on her current volume she would be the smallest superyacht in the world by LOA to exceed the 4,000gt mark. 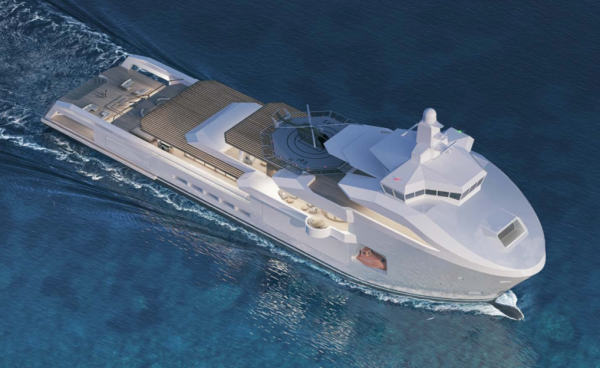 Through a company called Shackleton Superyachts, the current owner of 08 Kilkea, contrastingly, has teamed up with Edmiston and Bannenberg & Rowell. Commenting on the status and outfitting of the vessel, Tom Lilley, sales broker at Edmiston, says, "The hull and superstructure are complete, leaving the new owner free to express themselves with the fit-out and interior design. 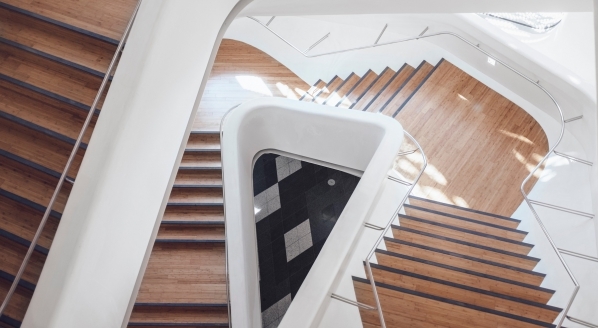 With the build well advanced, the delivery time will be significantly faster than a new project. 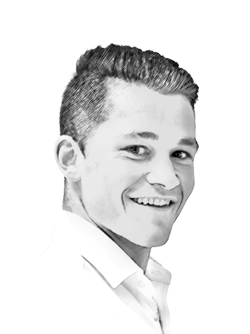 "The launch time will, of course, be dependent on the fit-out complexities and desires of the owner but it would be realistic to suggest a 2019 delivery. 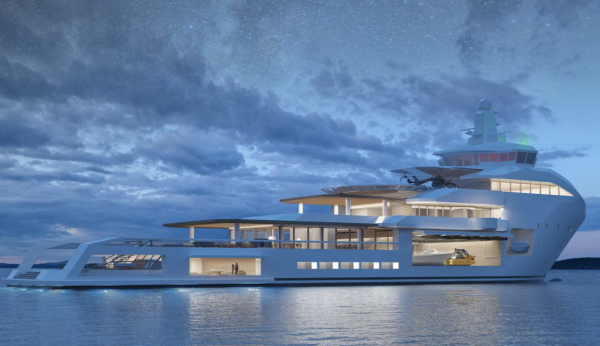 Supporting this timeline, Bannenberg & Rowell has worked to deliver some really exciting options on deck and interior design and layout, giving the new owner some wonderful concepts, while still leaving plenty of room to express themselves." The profile of 08 Kilkea looks to be less bow heavy, with a more evenly distributed arrangement over the full length of the vessel. The owner has suggested a gross tonnage of nearly 5,000gt with the allotted superstructure. 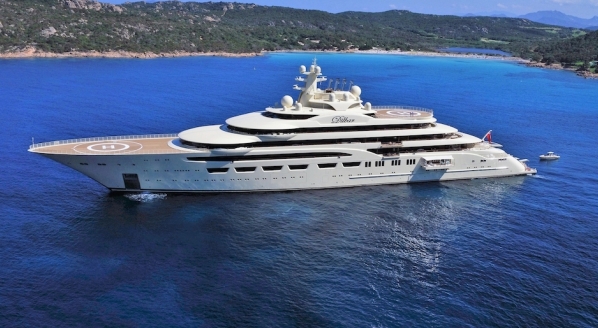 The crew quarters are forward on both vessels, but the tender hangar and helipad are aft on 08 Kilkea, leaving the mid-ships free for owner and guest areas (36 guests), which are distinctly separated by a large swimming pool deck area. Performance-wise – and due to their commercial configuration – there are many similarities between the two. Both have quadruple generator installations for a diesel-electric drive system with twin azimuthing pods. Fraser Yachts has cited an 863,000-litre fuel capacity for Brage, which would suggest a boundless range for extreme cruising. It would seem that the Pastrovich design is a more predictable but functional arrangement for exploration, retaining much of the vessel’s former commercial identity, but the inventive owner areas of the Bannenberg & Rowell design, fully utilising the waterline length, encapsulates the opulent living areas that the superyacht industry is more accustomed to – and lots of it.